NVIDIA Quadro FX 3500 by PNY graphics boards feature uncompromised performance and programmability at an entry-level price for professional CAD, DCC, and visualization applications. The NVIDIA Quadro FX 3500 by PNY offers a new level of interactivity for engineers, scientists, and designers by delivering ultimate performance, features, and quality; leading to shorter production cycles and faster time to market. 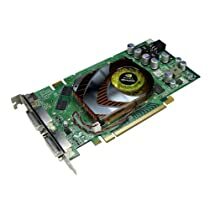 Architected for outstanding performance and quality, NVIDIA Quadro FX 3500 by PNY delivers 42.2GB/sec. memory bandwidth and a 256-bit memory interface with support for 256MB of ultra-fast GDDR3 memory. Featuring two dual-link DVI connectors, NVIDIA Quadro FX 3500 by PNY offers the industry's best image quality at resolutions up to 3840 x 2400.